A Personal Learning Network (PLN) is a way of mapping connections that you have to find answers, learn new things, contribute your own ideas and collaborate to create new and exciting opportunities. It also maps the online resources that you use to accomplish these tasks. Often these connections are made through social media. These social networks provide tremendous opportunities for teachers to enhance their professional development by networking with each other beyond the boundaries of a school, town or even country. In this course we network via Twitter with the use of #unietd hashtag. Thanks to that current students, graduates, and other people interested in the educational use of the technology can network and learn from each other. Reflect on how you can connect with resources and other professionals. This is a very important moment in your professional life. You need to decide if your current social media accounts are the ones you want to share with your future employers, parents, or even students. If the answer is "Eee... not really", you should start building your new professional digital footprint. Time to separate your private and professional life, teachers! A concept map of your Personal Learning Network may be not be complex because it is your initial opportunity to consider these networks. Your map should show what media you use to share information, ask questions, bookmark useful links, how you connect to experts in the field, etc. Connect end engage in conversation with other educators through Twitter. Connect with the author of your favorite book. Find (or create) a Symbaloo webmix that organizes important resources. You might even find a professor who stimulates your thinking. 6x6 rule for presentation: aim to include no more than 6 words per line and 6 bullet points per slide. You can include more text in a notes below your slides. How did you establish/find/create/use this resource? 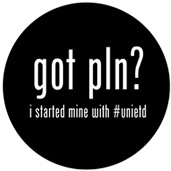 Towards the end of the semester, you will be asked to consider your PLN again. You will expand your initial PLN map to include all of the new professional learning resources that you found/created/established. You will then use your documentation to write a narrative talking about the growth of your PLN and how you will use it in your professional life. Submit the URL to google slides documenting your PLN in the eLearning assignment submission box. Make sure your slideshow is public. Copy and paste the address to avoid errors. narrative that describes what you did to expand your PLN over the semester. at least 5 resources/connections that you discovered/created. links to each of these resources. If you already have a Twitter or Pinterest and other social media account that may include explicit content or materials inappropriate for school, consider creating a separate professional account. All activities should positively represent you as a Pre-service teacher. 10% of points possible will be deducted If you submit the wrong URL or your account is not public and your instructor cannot access your profile.